All week long, we've had fun showing you Amanda Murphy's Winter Games collection--the perfect lead-in to the 2018 Winter Olympics! Today, we're sharing Amanda's patterns featuring the fabrics. If you're a fan of her work, you know you'll find fresh and clean designs with plenty of detailed applique as well as simple to sew but dynamic piecing. Enjoy as Amanda takes us on a tour of her Winter Games patterns! Winter Sports is the emblematic quilt of the collection—the athletes from the fabric blow up in large scale. Behind all the squares, I quilted ice skating rinks and mountains. There are also SVG files available, so if you have a digital fabric cutter you can easily cut all the accessories really quickly. 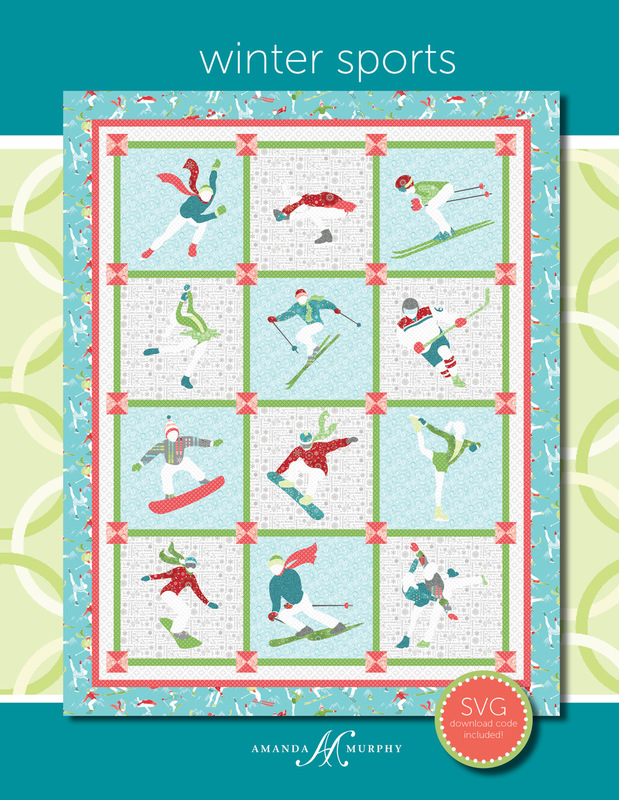 Click here to find Amanda's Winter Sports pattern. 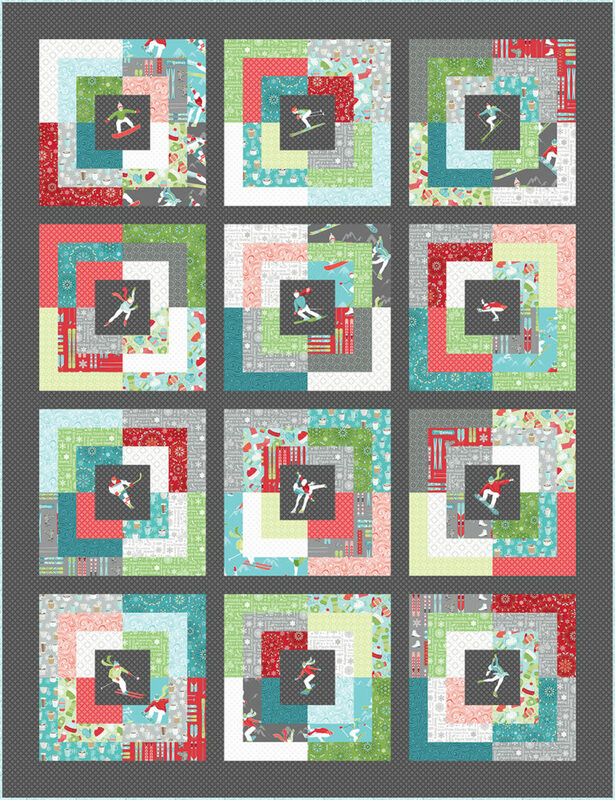 Here's one quilted close-up; see more photos of Amanda's Winter Sports quilt on her blog. Amanda has offered us a sneak peek at her next three patterns for the collection--they'll be available for sale soon--watch for more details on her blog! For Slope, I wanted to do a more modern quilt. 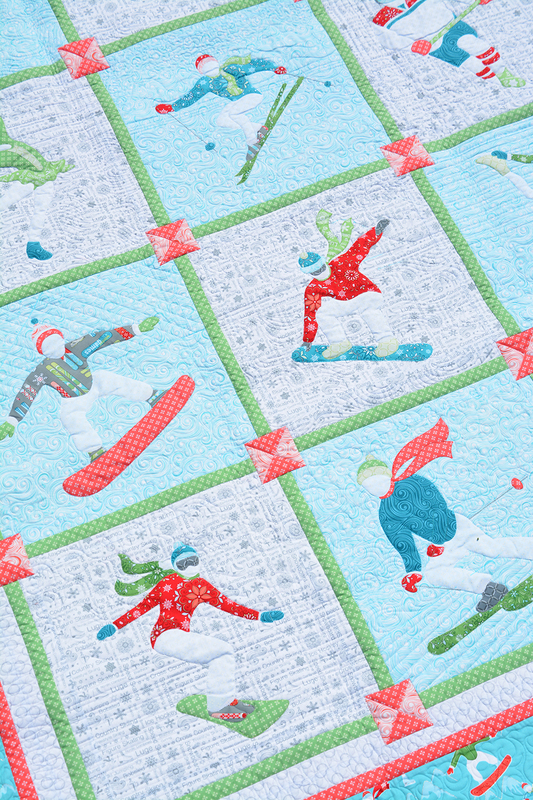 It’s my take on a modern quilt—skiers down the hill, but just the idea of that, not literally. 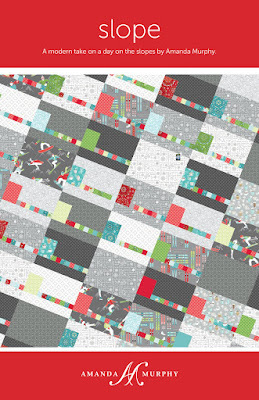 Snowfall is a traditional winter quilt that could be kept out all season—it’s not holiday specific. It’s all pieced blocks and sashing. I knew I wanted to make something with the mugs, and that’s where Fa La La Latte came about. It’s a take-off of the mug fabric. The bigger design can be used as a runner, and the smaller designs are placemats. It features traditional blocks but with a modern look. 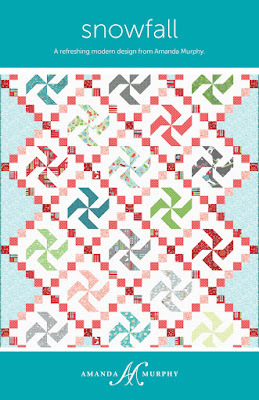 Amanda also designed a free quilt pattern using her Winter Games pattern. This quilt, called Skating Rink, is a log cabin variation featuring fussy-cut athlete appliques from the collection. The pattern is available as a free download from Amanda's website. 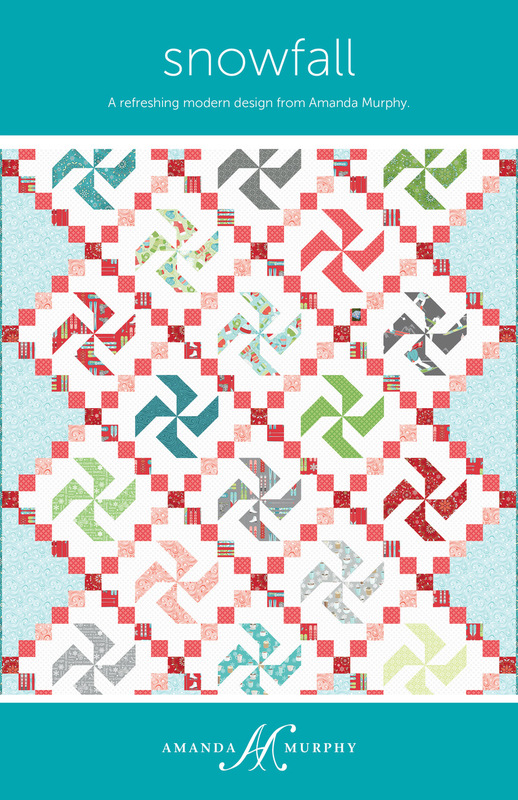 Click here to find out how to download Amanda's free quilt pattern. And we had to ask Amanda...does she have a favorite from these patterns? Winter Sports is probably my favorite. The background quilting is the type of quilting I really like to do. But Slope would be a close second. It’s very modern and sleek but it still works with the collection. And it really showcases all the gray prints. If you didn't catch our Mug Rug Blog Hop (featuring Winter Games! 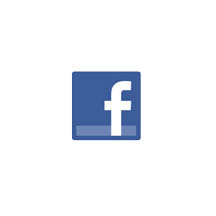 ), use the links below. Want to see more of Winter Games? Click here to read the interview with Amanda about her fabric. Click here to see the entire Winter Games collection. I like all of these patterns and the line of fabric. I'll be looking for it as I shop. I especially like Snowfall, yet all of the patterns would work specifically for someone special in my life! I signed up to follow Amanda after reading about her and seeing some of her patterns on the sight this week. Thank you for sharing! Loving this line and the new patterns for it!! 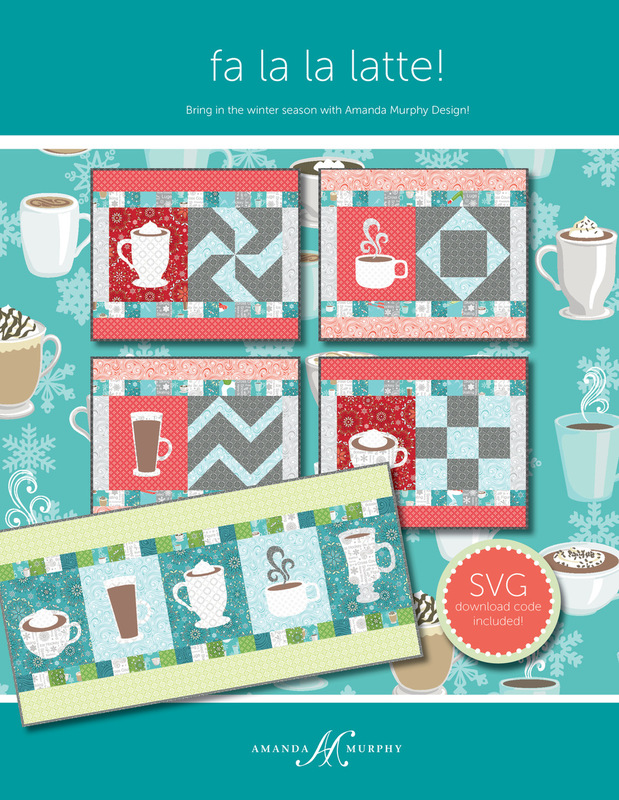 WHO WON THE 'Winter Games Mug Rug Blog'?